Posted by nrhatch in Art & Photography, Happiness, Humor, Life Balance. Clowns may be small or tall . . . with mindful balance they fail to fall! It is ironic that Red Skelton was such a great clown on stage and his paintings of clowns show talent there too. Even more ironic are the clown paintings of Charles Manson. Red Skelton knew how to clown around . . . didn’t realize the same could be said of Manson. Isn’t it ironic? I know that so many people have a terrible clown phobia! They have to be careful that it doesn’t clash with their noses . . . or their toeses. You wild woman! It’s these little things that make me lmao!! Good one. I’m glad to see I’m not the only one who sometimes thinks clowns are creepy. Stephen King is responsible for a lot of the clown/balloon phobia because of his book “It.” Those parts of the book did creep me out, but the fear hasn’t stayed with me. However, I’ve never been a huge fan of circus clowns – except maybe Emmet Kelly – he was wonderful and always made me smile. I do love actor clowns, though, and comedians, but now I’m getting conmpletely off the subject, so I will shut up! Boy, is my face red. . .
I’ve never read IT (or much of anything that King has written). Real life is horrific enough for me without self-induced nightmares from consuming terrifying brain food. That’s what I love about this photo ~ the red against the blue of the sky and the white of the church. This is a wonderful clown photo! and red!!! nice. Love the red but not so much the clowns. After teaching kindergarten a couple of years I found out just how many kids are afraid of clowns. Do you suppose it’s their “masked” faces? I don’t love clowns, but I do love the contrast of red and blue here. Great photo. I love the red in the picture. BUT, Clowns are a bit creepy to me – their faces are either painted in exaggerated smiles or frowns, which are both disturbing. 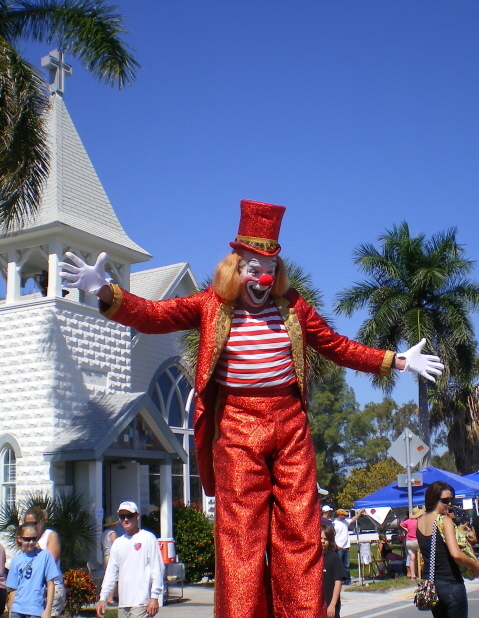 I’m not afraid of clowns…unless they are on stilts. AAAAHHHH! You would not have enjoyed seeing this clown then . . . he TOWERED over us!